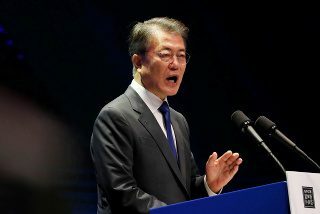 In an unusually pointed statement on the ongoing fear of a US attack on North Korea, South Korean President Moon Jae-in today gave a speech insisting that he has absolute right to veto any US military action against North Korea, and intends to do so. Moon declared the decision needed to be made “by ourselves and not by anyone else,” adding that he intends to prevent a war with North Korea “at any cost.” That’s a huge departure from previous reports suggesting South Korea was essentially along for the ride, and was backing whatever Trump would decide, hoping it would eventually end in peace. Analysts see this as reflective of growing frustration by President Moon, who campaigned on a return to diplomacy with North Korea, but has seen his brief time in office dominated by repeated US threats to destroy North Korea. Moon’s comments, to those analysts, are an attempt to reassert the traditional balance on the Korean Peninsula, where the US presence is about supporting their South Korean allies, as opposed to South Korea simply being stuck on the North Korean border while the US steams toward a nuclear war. It’s unclear, however, how well that will be received in the US, as the Trump Administration was already believed not to be thrilled with Moon’s pro-diplomacy bias, and in the past couple of months has re-branded North Korea as a threat to the US mainland, as opposed to a threat to South Korea and Japan. The timing may be in Moon’s favor, however, as Trump Administration officials appear eager to talk back the notion that a nuclear war is imminent, though both they and North Korea are making it clear they each regard the other side as wholly to blame for the soaring tensions.